On Saturday we had a day-trip to London to see ‘The Cult of Beauty’ at the V&A, before it closes (on July 17th so not long now if you haven’t already seen it!) It’s had some amazing reviews, and everyone seems to have seen it, and I’m glad we made the effort to go. 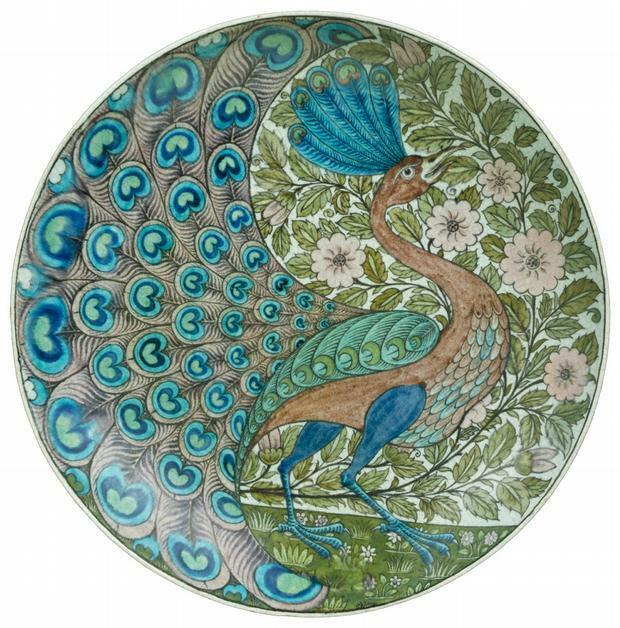 I can’t remember ever seeing such a remarkable collection of objects in one place, and the exhibition, true to the V&A’s approach, provided a fascinating mixture of objets d’art, paintings, furniture, books and other appropriate items (such as this marvellous William de Morgan dish). I won’t write a detailed review, since there are so many out there (see this in The Guardian, for example, which suggests that this exhibition could revise our view of Victorian art and culture, or this glowing report by Waldemar Januszczak), but in my opinion the exhibition mostly lived up to its reputation. The exhibition is devoted to the work of the Aesthetic movement, the hedonistic offspring of the Arts and Crafts Movement. The exhibition therefore builds up to the apex of Aestheticism: beginning with Pre-Raphaelitism, some earlier Rossettis, some Burne-Jones, Rossetti’s bedroom, etc; then moving towards the Arts and Crafts movement with Morris and Burne-Jones furniture (so beautiful I wanted to stroke it – but resisted), with its morality and integrity combined with its beauty (summarised in Morris’s famous line “Have nothing in your house that you do not know to be useful, or believe to be beautiful”). Finally we reach the apex of Aestheticism, culminating in the hedonism of Oscar Wilde’s “art for art’s sake”, the designs of Beardsley, and the paintings of Moore and Whistler. By now, meaning and morality have vanished in a backlash against the earlier Victorians, and a modern, sleek aesthetic has replaced the more realist designs of the earlier artists. This exhibition is not just a celebration of beauty, it is also a journey through the changing tastes of the Victorians. It’s a riot of colour and exuberance, and does credit to the designs and paintings of the nineteenth century, and will, I think, deservedly revive interest in them. The V&A website includes an interesting blog on Creating The Cult of Beauty if you want to find out more, or if you missed the exhibition. The Cult of Beauty exhibition, blog and catalogue look fantastic *drool*. I am quite happy to think that an exhibition of the products of the Aesthetic movement should make us revise our view of Victorian art and culture. But I would want to ask how widespread the taste for the Aesthetic movement was. If 75% of the critics and taste-makers, and 95% of the ordinary citizens were not familiar with Aesthetic values, or didn’t like them, it may have only been an influential minority movement.